Johnny at JazzFest: This weekend, all roads lead to the Big Easy. Johnny will play the New Orleans Jazz & Heritage Festival on Saturday, and the performance will mark his last scheduled U.S. appearance until June. Johnny and Muddy, together again: April 21 marks the Shout! 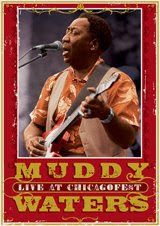 Factory release of Muddy Waters: Live at ChicagoFest, an electrifying 1981 performance at Chicago's top outdoor music festival. One of the legendary bluesman's last great performances, this 56-minute DVD features 12 performances, including Waters classics like "Mannish Boy," "Baby Please Don't Go," "Trouble No More" and "Got My Mojo Working." Johnny also gets into the act, handling vocal duties on "Going Down Slow" and "You've Got to Love Her With a Feeling." Johnny and the Allmans: If you enjoyed Johnny's guest spot with the Allman Brothers band on March 10, be advised that you can take it home with you. That performance -- along with all the other star-studded gigs from the ABB's 2009 stand -- are now available on CD. Click here for more information. On the road: After JazzFest, Johnny will be off until mid-May, when he'll embark on a three-week tour of Europe that includes scheduled stops in Germany, Switzerland, the United Kingdom, Denmark, Finland, Sweden and Norway. For a complete list of Johnny's current tour dates, click here.